The major culprits found in the bedrooms, dining room, and living room are dust, tracked -in dirt, and clutter. Still, you can shave precious moments off your whole house cleaning schedule with this basic cleaning routine for tackling each room in your home quickly and efficiently. Here's how to get housecleaning done right - and fast. The way Mom taught you to do dishes - wash lightly soiled cups and plates first, scrub the dinners pans with baked-on food last - works equally well as a cleaning routine for your home's surfaces. 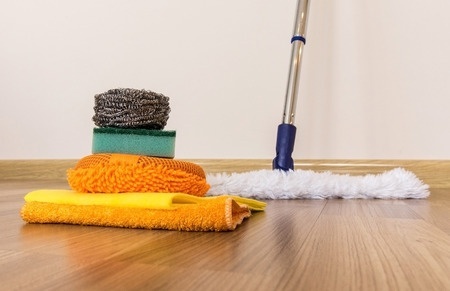 Your house cleaning routine should similarly start in the lightly soiled bedrooms, dining room, and living room. After you've completed those areas - and with a sense of accomplishment - work your way into the more challenging kitchen and bathroom cleaning. In each of these rooms, you'll use essentially the same method to clean; moving clockwise around each room, working your way from top to bottom. Make your mirrors and windows shine using glass cleaner (or a vinegar-and-water solution) and a squeegee. Shift into high gear for you cleaning routine by stocking up on basic cleaning products and supplies for the quick-and-dirty jobs that lie ahead. Gather cleaners, rags, paper towels, sponge, and scrub brush in the kitchen and bath so you won't have to backtrack between rooms to get what you need. By keeping a permanent stash of supplies in each of these rooms, you'll always be prepared to tackle those last-minute cleanups quickly and efficiently. One quick and easy weekly housekeeping schedule is to break down the big jobs into small, manageable tasks, and tackle them day by day. Clean the microwave Monday, the toilet Tuesday. Mop the floors Wednesday, tackle the tub Thursday. By Friday, your big target areas - the kitchen and bathroom - are nearly done. A few minutes spent Friday on surface duty, and your home is clean - and the weekend is yours. You can also quicken the pace of your weekly cleaning routine by focusing on a different type of cleaning each week. Choose an all-purpose cleaner this Friday, and spend several minutes spritzing and wiping the main surfaces of your kitchen and bathroom. Use a disinfectant cleaner next Friday, spraying on countertops, in toilets, and in the tub or shower. Then go read the mail or relax; return to flush the toilet and wipe clean the countertops and tub or shower. Dust this week, vacuum the next. This simple routine means no juggling of cloths and paper towels, switching of spray bottles, or putting away of dust rags as you pull out the vacuum. You focus on just one thing at a time. If you've got better things to do this week - or simply can't summon the energy for housework - it's OK to take a break from your cleaning routine. Going two weeks between disinfecting and dusting won't cause any irreparable harm, and taking a rest may do you good.